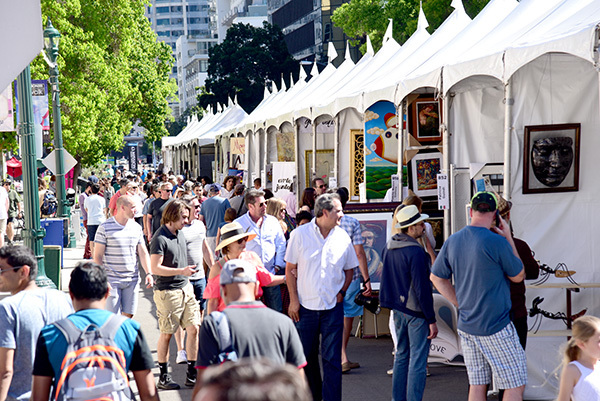 Every year, the streets of Little Italy transform at the annual Mission Federal ArtWalk with art from more than 350 artists from around the world on display! This year, Mission Federal ArtWalk will celebrate 35 years of bringing visual and performing art to San Diego on Saturday, April 27, and Sunday, April 28, from 11 a.m. to 6 p.m. The weekend-long premier arts and culture event spans 16 blocks and brings the community an opportunity to meet the artists behind the artwork and purchase art directly from them. More than 120,000 attendees roam the streets of Little Italy to browse every medium of art including painting, sculpture, glass work, photography, fine jewelry and more. Annual Mission Federal ArtWalk transforms Little Italy with its visual and performing arts. The surfboard art auction benefits ArtReach, Mission Federal ArtWalk’s nonprofit partner that delivers visual arts education to K-8 schools that have no other art education throughout San Diego County. Interested bidders can register online now and view the surfboards on both the Mission Federal ArtWalk and ArtReach websites, as well as at the event in the Piazza della Famiglia between India and Date Streets. Bidders can register online at charityauction.bid/artreachsandiego. Along with the auction, Artist & Craftsman Supply will return to host an interactive art project where attendees can come together and participate in making their own art prints. Guests can also enjoy Mission Federal ArtWalk’s new dance program, ArtMoves, which will be located on India Street near Grape Street. Rebekah Brown, San Diego Dance Theater’s performing arts coordinator, and Ian Isles, a San Diego based choreographer and dancer, will produce the spectacular dance performances. San Diego locals and visitors can spend the weekend exploring different types of art, meeting artists from around the U.S. and Mexico, and enjoying live entertainment in the Little Italy neighborhood! — Christopher Gomez has been Little Italy’s district manager since 2000. Reach him at chris@littleitalysd.com.